Pilot FriXion Rollerball Pen Refill Medium Black (Pack of 3) 075300301 Pack of 3 Pilot FriXion Refill Black Pack 3 075300301. Do not use for signatures, important or legal documents. No chemicals needed to erase. Same ink writes and overwrites. CAUTION: Heat sensitive ink. 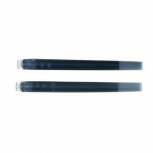 Q-Connect Reception Pen Refill Blue (Pack of 10) KF11048 Pack of 10 Refill for Q-Connect Reception Pen on Chain. 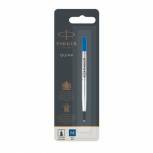 Provides you with smooth and flowing writing that looks fantastic. Designed to prevent ink leakage. Ink flows in an even and measured way. 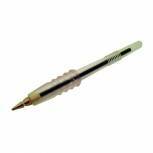 Removes the need to constantly change pens. Ink Colour Blue. 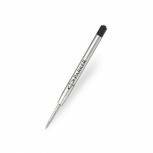 Fellowes Ballpoint Desk Pen and Chain Refill (Pack of 12) 0911501 Pack of 12 Refill for use with Fellowes Ballpoint Pen and Chain. Simple to fit. High quality ink. Ink colour: Black. 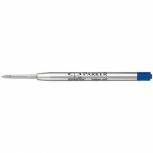 Pack of 12 refills..
Parker Quink Ballpoint Pen Refill Medium Blue Blister (Pack of 12) S0909580 Pack of 12 Parker Quinkflow refills are formulated for superior performance. Offering optimal writing with no breaks or blockages. Smooth, clean and consistent. Refill Blister. Blue. 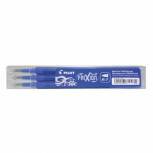 Pilot FriXion Rollerball Pen Refill Medium Blue (Pack of 3) 075300303 Pack of 3 Pilot FriXion Refill Blue Pack 3 075300303. Do not use for signatures, important or legal documents. No chemicals needed to erase. Same ink writes and overwrites. CAUTION: Heat sensitive ink. 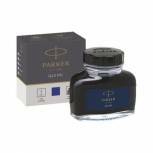 Parker Quink Blue Permanent Ink Bottle 2oz S0037470 Pack of 1 High quality ink for fountain pens. Formulated for superior performance with no skipping or scratching. Absorbs well to dry quickly. Permanent ink for long-lasting results Supplied in 2oz (57ml) bottle. Ink colour: Blue. 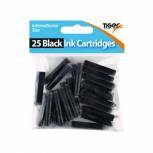 Parker Black Quink Permanent Ink Cartridge 12x5 (Pack of 60) S0881570 Pack of 12 Parker Quink Ink cartridge. For use in a range of cartridge pens. Features rich and bold ink. Smooth flowing and quick drying 5 packs of 12 cartridges (60 total). Colour: Black. Capacity: 57ml (each). 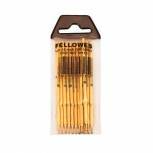 Parker Quink Ballpoint Pen Refill Medium Black Blister (Pack of 12) S0909550 Pack of 12 Parker Quinkflow refills are formulated for superior performance. Offering optimal writing with no breaks or blockages. Smooth, clean and consistent. Refill Blister. Medium. Black. 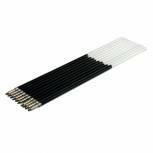 Parker Quink Ballpoint Pen Refill Fine Black Blister (Pack of 12) 1950367 Pack of 12 Parker Quink refills are formulated for superior performance. Offering optimal writing with no breaks or blockages. Smooth, clean and consistent. Refill Blister. Fine. Black. Parker Quink Ballpoint Pen Refill Fine Blue Blister (Pack of 12) 1950368 Pack of 12 Parker Quink refills are formulated for superior performance. Offering optimal writing with no breaks or blockages. Smooth, clean and consistent. Refill Blister. Fine. Blue. 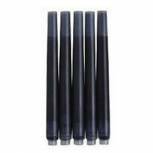 Schriptor Counter Pen Set Refill Black (Pack of 10) 410/R1 Pack of 1 Schriptor 410 Counter Pen Set Refill Black Pack of 10 410/R1. Ergonomic with grip. Transparent barrel. 0.5mm line width. Easy to fit to base unit. 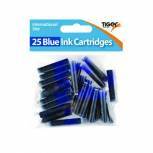 Parker Blue Quink Permanent Ink Cartridge 12x5 (Pack of 60) S0881580 Pack of 12 Parker Quink Ink cartridge. For use in a range of cartridge pens. Features rich and bold ink. Smooth flowing and quick drying5 packs of 12 cartridges (60 total). Colour: Blue. Capacity: 57ml (each). Parker Rollerball Refill Medium Black (Pack of 12) S0881230 Pack of 12 Parker Rollerball Pen Refill Medium Black S0881230 Offering optimal writing with no breaks or blockages. The smoothest, cleanest and most consistent Parker refill ever. For an extra smooth writing experience. Black. Pack of 12. Parker Rollerball Refill Medium Blue (Pack of 12) S0881250 Pack of 12 Parker Rollerball Pen Refill Medium Black S0881230 Offering optimal writing with no breaks or blockages. The smoothest, cleanest and most consistent Parker refill ever. For an extra smooth writing experience. Blue. Pack of 12. 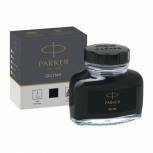 Parker Quink Black Permanent Ink Bottle 2oz S0037460 Pack of 1 High quality ink for fountain pens. Formulated for superior performance with no skipping or scratching. Absorbs well to dry quickly. Permanent ink for long-lasting results Supplied in 2oz (57ml) bottle. Ink colour: Black.